In this project we use multiple datasets to explore taxicab fare payments by neighborhood and examine how access to taxicab services is associated with use of conventional banking services. Since 2008 yellow taxis have been able to process fare payments with credit cards, and credits cards are a growing share of total fare payments. However, the use of credit cards to pay for taxi fares varies widely across neighborhoods, and there are strong correlations between cash payments for taxi fares, cash payments for transit fares and the presence of unbanked or underbanked populations. In this paper we use multiple datasets to explore taxicab fare payments by neighborhood and examine how access to taxicab services is associated with use of conventional banking services. Taxicabs are a critical aspect of the public transit system in New York City. The yellow cabs that are ubiquitous in Manhattan are as iconic as the city’s subway system, and in recent years green taxicabs were introduced by the city to improve taxi service in areas outside of the central business districts and airports. Approximately 500,000 taxi trips are taken daily, carrying about 800,000 passengers, and not including other livery firms such as Uber, Lyft or Carmel. Since 2008 yellow taxis have been able to process fare payments with credit cards, and credits cards are a growing share of total fare payments. However, the use of credit cards to pay for taxi fares varies widely across neighborhoods, and there are strong correlations between cash payments for taxi fares, cash payments for transit fares and the presence of unbanked or underbanked populations. These issues are of concern for policymakers as approximately ten percent of households in the city are unbanked, and in some neighborhoods the share of unbanked households is over 50 percent. In this paper we use multiple datasets to explore taxicab fare payments by neighborhood and examine how access to taxicab services is associated with use of conventional banking services. There is a clear spatial dimension to the propensity of riders to pay cash, and we find that both immigrant status and being ‘unbanked’ are strong predictors of cash transactions for taxicabs. These results have implications for local regulations of the for-hire vehicle industry, particularly in the context of the rapid growth of services that require credit cards. Without some type of cash-based payment option taxi services will isolate certain neighborhoods. At the very least, existing and new providers of transit services must consider access to mainstream financial products as part of their equity analyses. Overall there are observable differences for cash payments by taxi type, location, trip origin and trip destination. It is impossible to know what characteristics differ between a typical yellow cab passenger and a typical green cab passenger, but something leads green cab passengers to use cash far more often than yellow cab passengers. The results shown on the maps suggest that there is a spatial factor in play. In all maps there are stark lines that demarcate where riders predominately use cash (shown in yellow) and where they use credit (shown in blue). The areas marked with yellow are the places where cash is king. With the exception of a credit card hotspot surrounding Columbia University in Morningside Heights Manhattan payment types divide cleanly along income lines, where wealthy neighborhoods flanking Central Park (the empty white rectangle in the middle of the map surrounded by blue to the south and yellow to the north) on the Upper West Side and Upper East Side pay for taxi trips mostly with credit cards and poorer neighborhoods to the north in Spanish and Central Harlem are dominated by cash. One interesting aspect is that the socio-demographic characteristics of neighborhoods seemingly play a large role in determining payment type. It is likely that the cash or credit choice is a function of access to a bank account, for which these spatial data are a good proxy. Another takeaway is that much of the city still does not produce a lot of taxi trips and there is not enough data to present primary payment types at all. EXIT has been fully updated and is on view at the Palais Tokyo in Paris from November 25, 2015 – January 10, 2016. The project was initially completed in 2008 but has been fully updated to coincide with Cop21, the United Nations Conference on Climate Change. Thanks to Andy Kirk for the nice write up on SIDL's collaboration with Alex Gil, Digital Scholarship Coordinator, Humanities and History Division, Columbia University Libraries. "Might be a little late to this but I have been exploring the absorbing 'The Library Project', a collaboration between the Spatial Information Design Lab at Columbia University, led by Laura Kurgan, and visualisation design/developers Annelie Berner, Jen Lowe and Derek Watkins. The motivation for the project is framed around a desire to create a way of 'comprehending the immensity, character and value of the collection'. As more data about the library's collection becomes digitised, these tools enable a novel means of exploring the shape, dynamics and relationships that exist amongst the vast collection." 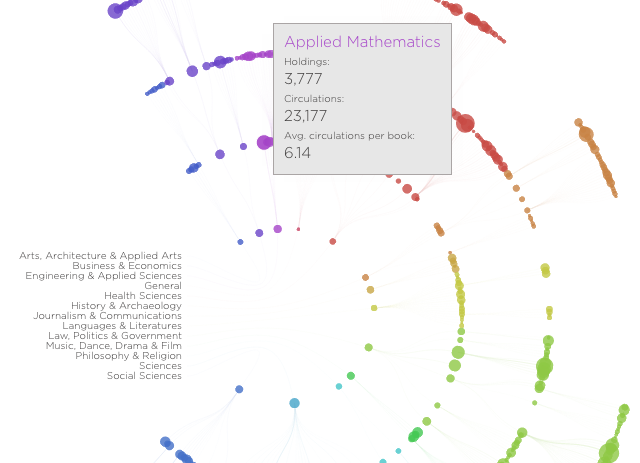 Experimental methods of visualizing and searching the Columbia University Library catalog. 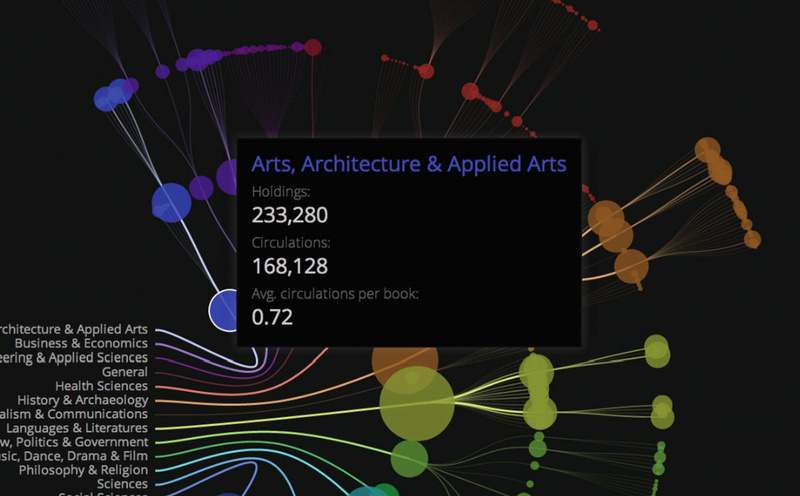 A visualization of the Columbia Library's holdings, circulation and activity. Today, when one walks into a library, whether public or private, there is no way to comprehend the immensity, character and value of its collection. Perhaps this is visible in the vastness of the stacks, or of the building, but for the most part, the collection remains invisible. “Serendipity Search” will allow for surfacing of books and other media stored in the library, into the hands of researchers and interested individuals through a more compelling and curiosity-provoking interface. In our current prototype, at the first level, we have visualized the Columbia Libraries collection in a single interactive interface. At the second level, we have designed our first tool which browses library book which have multiple subjects in their metadata. "States of Design 01: Visualization"
"Commissioned by the Fondation Cartier pour l'art contemporain, in Paris as part of a 2008 exhibition entitled Terre Natale and realised by a stellar team of architects, designers and programmers, Exit is a testimony to the political power of design. It was conceived to illustrate curator and cultural theorist Paul Virilio's belief that "humanity is now defined by migration". 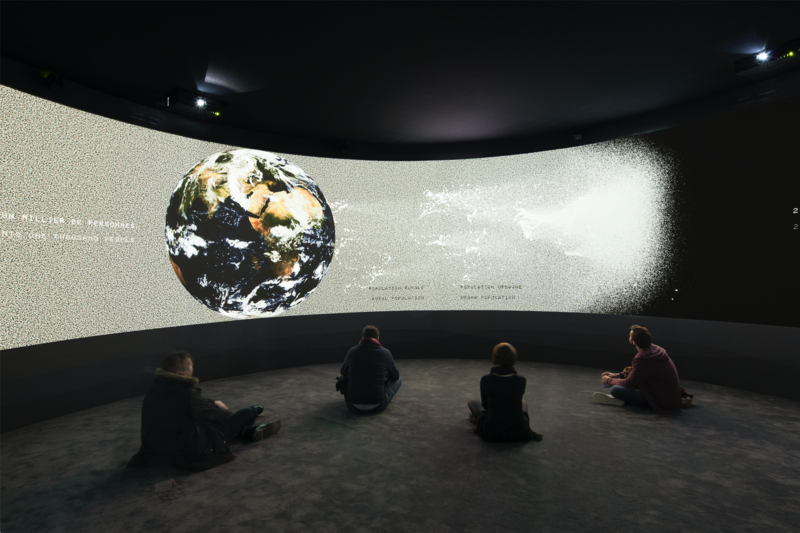 Through a series of six panoramic data-visualisation narratives displayed over the course of forty-five minutes on a round screen, the installation "quantifies both voluntary and forced movement across the globe due to political, economic and environmental factors". 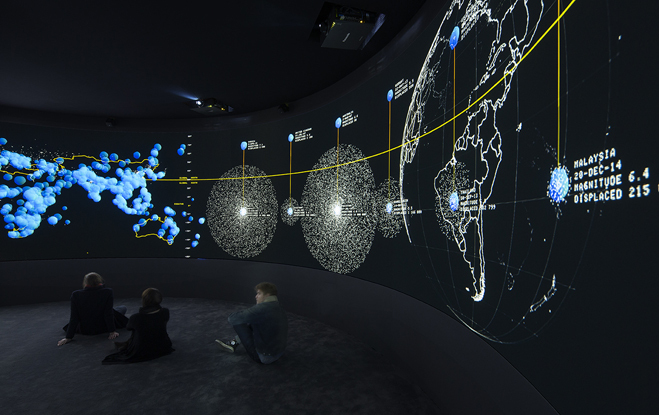 In one instance, a glowing map of the world is projected onto the walls, with blooms of light indicating relative responsibility for carbon emissions aggregated by population density; in another, remittances (money sent back by a migrant labourer to his or her nation of origin) are tracked by country, demonstrating that in some nations total remittances received exceed foreign aid. The design of the theatre and installation was such that viewers were literally wrapped in a universe of information, transmitting a sense of both global scale and immediacy that is lacking when these facts are presented through the usual media channels." An investigation into ways to rebalance CitiBike stations throughout New York City. As has been recently documented by the press, one of the major challenges that Citi Bike is facing is the rebalancing of their stations. As origins and destinations of Citi Bike trips are not necessarily symmetrical during the day, Citi Bike has been forced to constantly move bikes around the city, taking them from full stations and delivering them to empty ones. This problem is both financially expensive and frustrating for Citi Bike users: many people complain about either not finding bikes at their stations of origin or not finding empty spots when they arrive at their final destinations. To study this problem we have created a series of visualizations which should serve as a starting point for further analysis. First, we visualized the average activity for weekdays in October 2013. As the above image shows, the activity hotspots remain pretty constant throughout the day, specially between 10am and midnight, with most of the activity centered around Union Square. In addition, we also see how both Grand Central and Penn Station become strong hotspots during peak hours. Of interest, though, is the sudden shift that occurs around 5am, with the activity hotspots switching from the East Village/Lower East Side area, to Grand Central and Penn Station. This is probably due to the fact that during most of the night, compared to other areas, the stations in the East Village/Lower East Side continue to have high activity, but during most of the day, and specially during peak hours, they are not as active as the stations around Union Square or Grand Central and Penn Station. 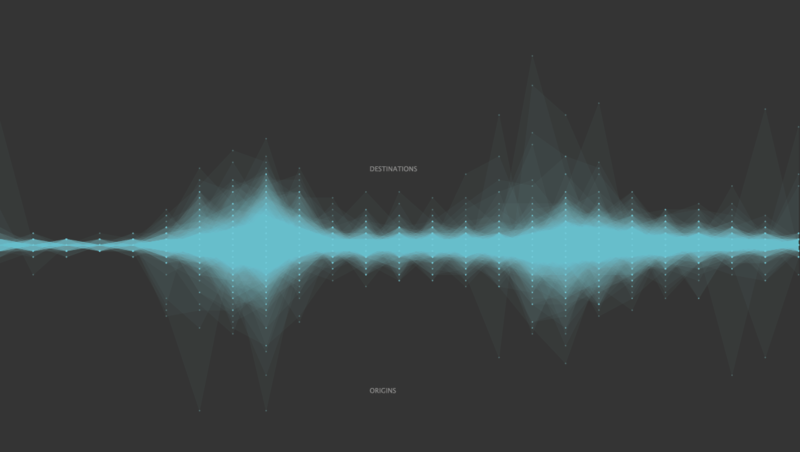 Next, we visualized overall patterns of origins and destinations. As the above image shows, the big hotspots of imbalance are mostly located around the East Village, Lower East Side, Midtown East and West and Union Square. However, the variation of these hotspots throughout the day is pretty extensive and it's very difficult to detect smooth transitions apart from peak hours. Of note are a couple of big "jumps" between origins and destinations, one of them around 1-2pm on the East Village/Lower East Side and another one around 5am also in the same area. We also created a series of imbalance matrices (by hour of day) for every single station on the system. Again, using the same data as the animations above, this first matrix (Citi Bike Hourly Balance) clearly shows how the big imbalances happen (as expected) mainly between 6am and 10am (morning peak hour) and between 4pm and 8pm (evening peak hour). However, there are some stations whose imbalance starts and ends earlier, like 8th Ave. & 31st Street, W 33rd Street & 7th Ave. and W 41st Street & 8th Ave. (more origins than destinations starting around 2pm). In addition, this matrix also shows that not all of the stations suffer from big imbalances during peak hours. Indeed, stations like E 31st Street & 3rd Ave or E 32nd Street & Park Ave. barely have any imbalances during peak hours. You can download a high-res version of this matrix here. Furthermore, as not all of the stations have the same level of activity, we produced two more matrices, both showing station imbalance, but this time comparing it to the overall hourly activity for each station. 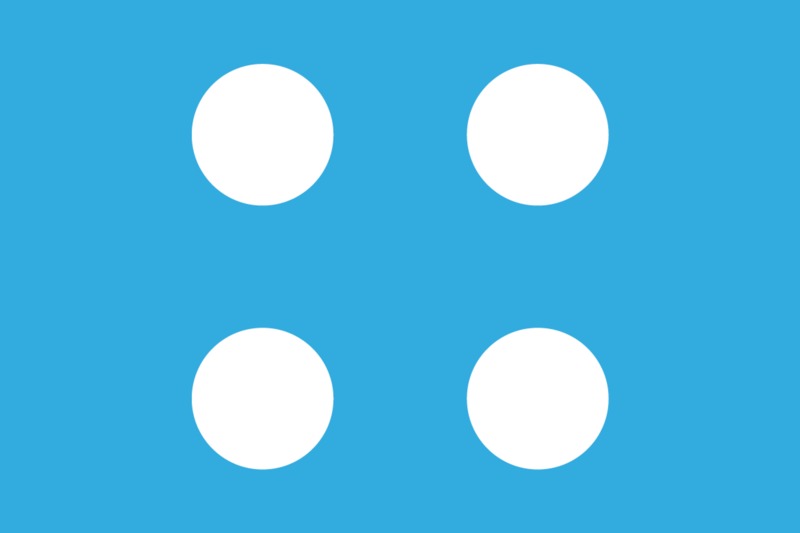 The first one (Imabalance matrix normalized by hourly activity) shows the imbalance as a percentage of the activity for that hour. Hence, the great imbalances appearing late at night, when there are fewer trips and there's a higher chance of having all of them as origins or destinations. However, it is still interesting to see that there are higher imbalances during the morning peak hour than during the evening one, as a percentage of the overall activity. The second matrix (Activity and imbalance matrix) shows the imbalance as colors and the overall activity as brightness, so we can see how in the hours between the peak times there's still a lot of activity but it is mostly well balanced. In addition, we can see how late at night (imbalanced as it may be) there's still very little activity. Finally, we can also see some outlier stations with a lot of activity and still pretty imbalanced: for example, in the morning 8th avenue and 31st street, 17th street and Broadway, Lafayette and 8th street, and Pershing Square (north); and in the evening 8th avenue and 31st street, 41st street and 8th avenue and again Pershing Square (north). You can download both of these matrices at high res here and here. Finally, we have created hotspot maps for both the AM and the PM peak hours. As you can see from the maps below, Citi Bike activity closely matches what we would expect to see in New York: the AM peak hour map shows people leaving residential neighborhoods (Lower East Side, East Village, Chelsea and Hells Kitchen) and arriving at Midtown East and the Financial District, and the PM peak hour map shows the reverse. To note, however, is the fact that these two maps are not completely symmetrical, meaning that there are certain trips that happen in the morning which do not have their counterpart in the evening, and vice versa. Also, there are some stations that while being inside imbalance hotspots do not show that large of an imbalance. These stations have been outlined on the maps and should be further studied. You can view high-res versions of these maps here: AM and PM. As part of the Urban Design Event Series (5 Borough Studio, Summer 2014), Juan Francisco Saldarriaga presented the lecture Activity Mapping, at the Graduate School of Architecture, Planning and Preservation, Columbia University. "Since technology is responsible for growth in the world’s collective knowledge, it also shares the responsibility of categorizing that knowledge into easily digestible bites. Because what’s the use of this glut if it can’t easily be understood? And in order for data to have the largest possible impact, doesn’t it make sense for it to be understandable by researchers and blog-readers alike? This conflict is one of the main issues breathing life into the Advanced Data Visualization Project (ADVP), a data analyzation project now in its second year at Columbia University. Birthed from a collaboration between international newswire Thomson Reuters and Columbia University’s Graduate School of Architecture, Planning and Preservation (GSAPP), the ADVP is looking to make intricate systems--like neurons, international port logistics and library catalogues--both easily readable and stunningly beautiful." "Columbia University and Thomson Reuters today announced the launch of the Advanced Data Visualization Project (ADVP) based at Columbia's Graduate School of Architecture, Planning and Preservation (GSAPP). The initiative, sponsored by Thomson Reuters, will facilitate research into data visualization and its implications for academia and industry in a world increasingly awash with data."